Artists who are serious about mastering color know the value of "doing the charts". 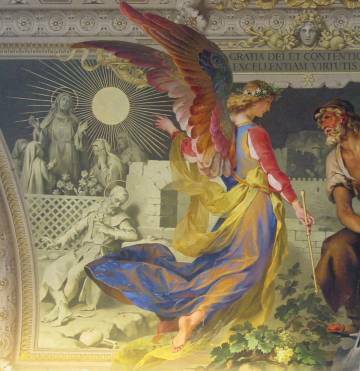 Nothing increases the mastery of your palette more effectively than the systematic creation of color charts with hue and value gradations for the colors in your palette. Now ColorFrontier™ eliminates the need to mask and prepare charts with sticky tape by hand. A peel up mask with a grid of 55 square openings is placed upon a blank panel, ready for your paint, and provides for the value and mixture studies of an average, balanced palette of 11 colors or fewer as in the case of a limited palette. (Patent No. 6,857,875). 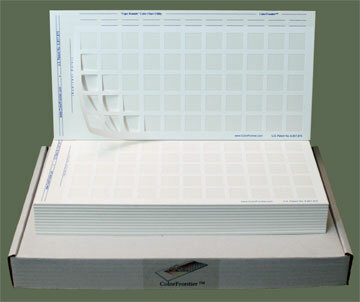 A set of 12 panels with templates in place and Free Shipping*. $99 Total. I am pleased to announce my latest production, and it's better than ever. A 3 mm board thickness, (instead of the past 4 mm), means the charts are 25% lighter, compact and more portable. All edges are block-planed by hand. A palette knife and some hangers are included with each set...... and again, SHIPPING IS FREE to ALL 50 states, IPOs and Peurto Rico. ~~ For a PDF of Helpful Tips, click here. ~~ For a PDF describing a typical palette, click here. 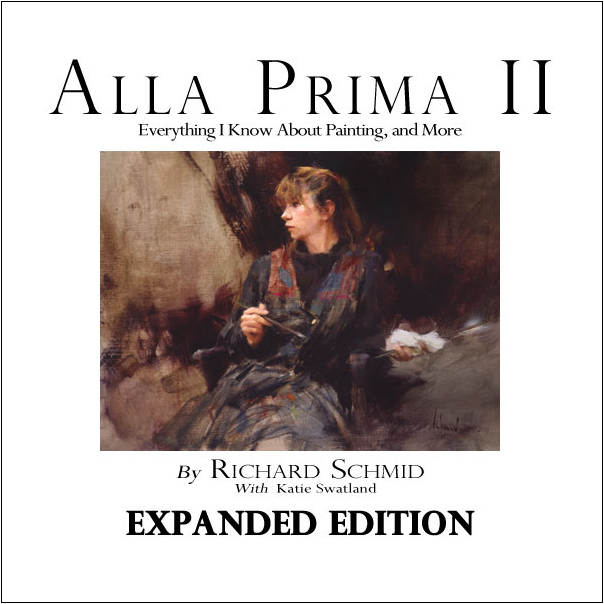 Generally regarded as the art world's foremost book for painters seeking serious instruction in representational painting, Alla Prima-II is available at www.richardschmid.com along with other great items, including Katie Swatland's "Companion" to Alla Prima-II, DVDs and much more. 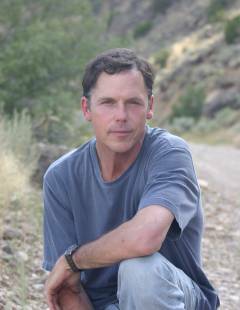 NEW RELEASE- An exciting HD video download entitled "RICHARD SCHMID PAINTS MICHELLE DUNAWAY", A Film by Scott Burdick. * FREE SHIPPING to all 50 States, APO's and Puerto Rico. **International Shipments: Please email me with your shipping address and I'll send a separate PayPal invoice for a $35 USD flat rate shipping charge based on the US Postal Service. If we find that your destination isn't served by the USPS, and alternate costs are more, we'll send a shipping quote for your consideration. International shipping is easy. - Orders usually ship within 24 to 48 hours of receipt. Orders received late Friday and beyond may not ship until Monday. Our time zone is GMT 05:00, Eastern Time US. You can certainly call or mail in your order. - Satisfaction Guaranteed: If you are not satisfied for any reason, simply return (in any condition) within 30 days from date of receipt for a refund.